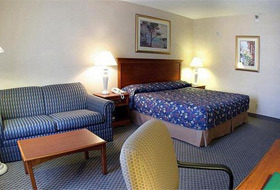 The California Suites Hotel is one of the prime options amongst budget San Diego motels and hotels. 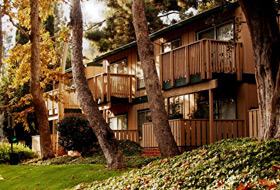 Not only do they offer one of the most competitive prices for vacation rentals and lodging in San Diego, but they are conveniently located, only 15 minutes away from San Diego International Airport, San Diego Zoo, Sea World, major shopping centers and white sandy beaches. Notes: Continental breakfast included, fridge and microwave in all rooms. 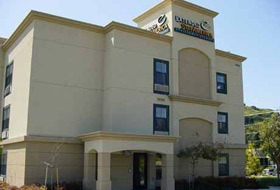 Get FREE high-speed Internet access at this Courtyard Located in the Clairemont/Kearny Mesa area of San Diego near SDG&E, Raytheon, Lockheed Martin, Kyocera, Northrop Grumman, MCAS Miramar and Jack-in-the-Box corporate offices, the San Diego Central Courtyard is the perfect choice for business travelers. Just minutes north of Mission Valley and a short drive from SeaWorld and the San Diego Zoo, leisure travelers feel at home too. 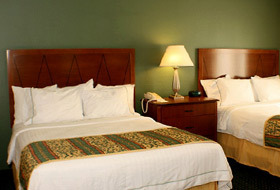 Notes: Centrally located, complimentary high speed wireless internet service in bedrooms. This hotel is designed especially for longer stays with studios featuring fully-equipped kitchens and plenty of work space… amenities you won't find in a typical hotel room. 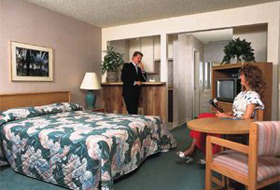 Their studios provide the comforts and conveniences that long-term travelers value most, including full-size appliances, computer data ports and separate sleeping, living and working areas. Notes: Kitchen with appliances and cooking utensils, wireless internet for $4.99 per stay. Hampton Inn San Diego / Kearny Mesa is located in one of the country’s most vibrantly beautiful cities and is the finest of all the hotels by SeaWorld. Recipient of Hampton Inn's "Inn of the Decade" & San Diego's "Finest Service Award," our hotel is a relaxing bastion of affordability. Hampton Inn offers our guests close proximity to La Jolla, SeaWorld, San Diego Zoo and miles of California's golden beaches and the exotic excitement of Mexico. Notes: Hot breakfast buffet, computer with internet acces in lobby, heated outdoor pool. A brilliant setting among San Diego Mission Valley hotels. Perfect sunny weather, premier shopping, and world-class entertainment, the Holiday Inn San Diego Mission Valley is the ideal choice of San Diego hotels for your next vacation or business meeting. Catch some rays at a pristine beach, cheer wildly at a Padre Game at Petco Park, or shop till you drop at two renowned shopping centers. Notes: Dry Cleaning pickup/Laundry, outdoor pool, wireless data connection for $10.95. Kids eat free. 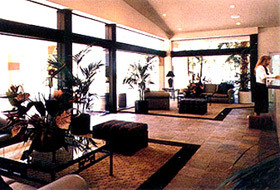 Whether you're on vacation, attending a sports event, or planning a conference, social function or wedding, we invite you to experience a personal best in hospitality and service.We're perfectly positioned near Qualcomm Stadium, just minutes from all of San Diego's must-see attractions and major business centers. Our 150 sunny guestrooms and suites, stylish amenities, tropical pool and spa, make every guest a VIP. Notes: 6-10 am Breakfast / 5-9pm Dinner, microwave available upon request. The Residence Inn by Marriott® San Diego Central Kearny Mesa is an upscale San Diego, California extended stay all-suite, apartment style hotel. 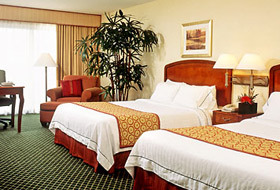 Our hotel is ideally located in the heart of the inland area of San Diego County. With easy access to Interstates 5, 805, and 15, we're the perfect home base for excursions to the many popular attractions that draw visitors from around the world. 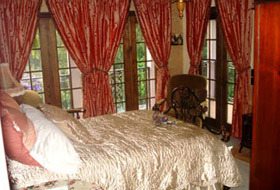 The Black Orchid Bed and Breakfast is located in the magical place of sand, sea, and sun of Encinitas, California. Known as an ideal walking town, Encinitas is lined with boutiques, coffee shops, fine restaurants, etc. The Black Orchid Bed and Breakfast is only a milefrom the beautiful Moonlight Beach, three blocks from the famous Quails Botanical Gardens, 10 minutes from the Del Mar race track, and 30 minutes from downtown San Diego. 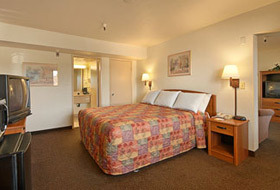 Days Inn is conveniently located off the I-5 on Encinitas Blvd. between Los Angeles and San Diego. The property is in close proximity to Legoland and all major San Diego attractions: Sea World, San Diego Zoo/Balboa Park, Old Town, Factory Outlet Mall, Delmar Racetrack and Fairgrounds, Rancho Santa Fe Polo Fields. 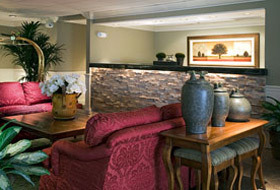 They offer a sparkling heated outdoor pool and sun deck for your enjoyment. Notes: Micorwave & Refrigirator, continental breakfast 6:30am-9:30am. Amtrak nearby. You couldn't ask for a much better location to live in -- The Bluffs II is in smack in the center of the Mission Valley neighborhood of San Diego, and we can promise you'll never be bored! We hope you're the energetic type who likes to live life to the fullest every day. Walk to Fashion Valley from your home (though you might want to take a car if you're doing more than window shopping!) for dozens of shops and restaurants.